My most recent trip was really successful, thought I would share my finds. 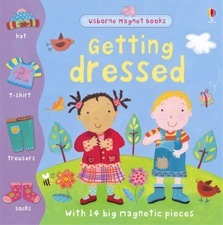 I got a Usborne magnetic book about dressing up, practically new. I love Usborne books, beautiful pictures and they cover all subjects and ages. If you need a book to explain something i.e. the beach, Christmas, nature, Usborne has written a book on it. Edie is currently loving their book 'That's not my Mermaid'. Freya calls them mermalades, sometimes it's no fun correcting children, I prefer her word for them. I also got an Early Learning Centre 'learn to knit' kit. It will be many years before the girls will get any use out of it but you have to buy these things when you see them. 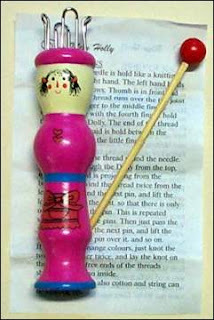 The kit includes needles, wool and a French knitting 'dolly'. I have really fond memories of French knitting when I was a kid. It's a shame that all you end up with is a knitted rope but it may buy me some quiet time for a cuppa in years to come. Craig and I talk about teaching the girls to amuse themselves being money in the bank for later. I also picked up a ladies size 14 tutu for Freya's dressing up box. It needed a belt but she is made up with it, very Folies Bergere. She's loving dressing up at the moment. I will be keeping my eyes peeled, hoping for hats, kimonos and long gloves. She is currently clip-clopping around in plastic kitten heels. My final purchase was this pair of Christmas dishes. I thought they were really cute and I also thought it was a real shame that these had been handmade and then given away. Well, I like them Jessica and Ellie. I blame Kirstie Allsopp for my love of vintage, she hasn't got me 'skipping' yet, I'm not designed for it. Craig's friend John used to say that there are people genetically made for rooting around in skips, they are individuals gifted with short legs and long arms. Apparently, men rooting around in your skip was rife in Walton. A good days thrifting though.